The Isabella Blow bookfight rumbles on! After recounting the insults traded by Detmar Blow, Tom Sykes, and Lauren Goldstein Crowe over their just-released biographies of the British fashion editor/icon, who died in 2007, we received an irate missive from Crowe. How strange of you to recall, step-by-step, the grisly tale between myself and Tom Sykes ("Competing Isabella Blow Biographers Attack Each Other," November, 11, 2010) but when it comes to my completely coherent clarification to decide to "act like some voice of morality" and point out that "a trouble [sic] woman died," and accuse us both of pandering for publicity's sake. In fact the moral move, journalistically speaking, would have been to mention that my comment about my party, ("Detmar's sister and cousin were there as were both Isabella's sisters and her step-mother and a variety of cousins. Also Philip Treacy and Lucy Ferry who didn't attend Detmar's launch. But hey, that's the world we live in,") was intended only for a few friends and made little sense without the accompanying clip on the party from the Daily Mail, which was primarily about my relationship with Jude Law. (Below). I spent well over a year writing a book about this "troubled woman," one which I am proud to say that many of the people closest to her - including those who came to my party - found a moving, fitting and entertaining tribute, but see no reason that her tragic death should stop me from correcting the item that ran on Racked, or indeed on Jezebel. My email never attacked Detmar or Tom, merely pointed out some facts that might help journalist friends in selecting photos, should they decide to cover the event. I have never said that my book is better than Detmar's, only that it is different - as is evidenced by their very titles. For the people who want to read about her marriage to Detmar and the complicated relationship they both had with their families, then Blow by Blow is the book for you. If, however, one is more interested in the behind-the-scene stories of her, well, of her life in fashion and why she became the creative visionary she was, then my book, Isabella Blow: A Life in Fashion, will probably be more satisfying. In actuality this is thanks to extensive interviews with many people who couldn't attend my party - namely designers like Julien MacDonald and Jeremy Scott with whom she was close, photographers with whom she travelled and worked for long periods of time, like David LaChapelle and Donald MacPherson and many talented others including Katie Grand, Nadja Swarovski and Daphne Guinness. 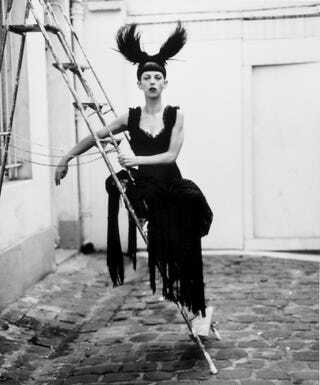 Yesterday, I wrote that I thought it was a shame that Isabella Blow, a talented and deeply troubled person who led an interesting life and whose place in the history of fashion cannot and should not be diminished, was in the news because the authors of two new books couldn't quit sniping at each other over who came to whose book party and whether or not Blow liked her stepmother. The kindest possible reading of this whole situation is that a near-simultaneous publication date inadvertently nudged these writers towards a public spat; the saddest reading is that the messy family conflicts and personal disappointments Isabella Blow faced in her life have spilled over into her death, and those responsible for the public keeping of her memory have been unable to resist dragging them into print in Page Six. Now that I am in receipt of the above, I stand by that opinion all the more.